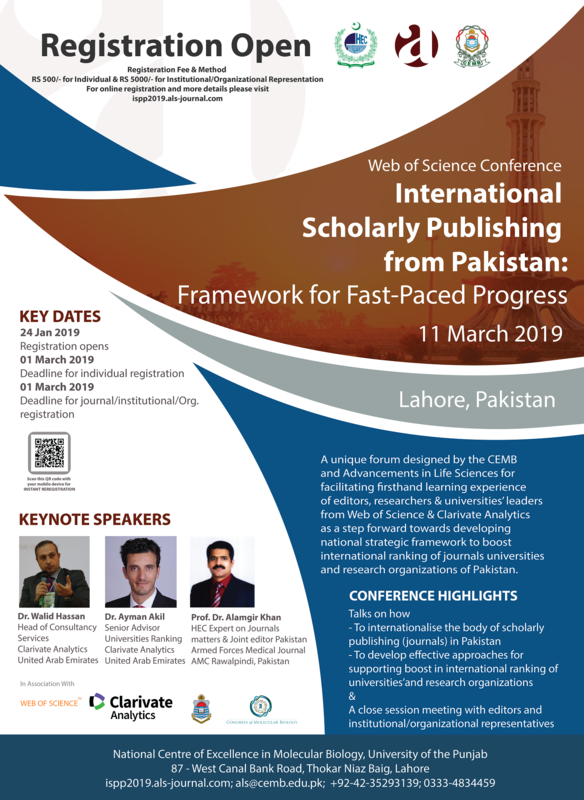 We are very excited to annouce that Advancements in Life Sciences and Centre of Excellence in Molecular Biology, University of the Punjab, Lahore are organizing one day Web of Sciences conference entitled "International Scholarly Publishing from Pakistan" at National Centre of Excellence in Molecular Biology, Lahore on 11th March 2019 collaboration with HEC. This is a unique forum designed for facilitating firsthand learning experience of editors, scientists, research organizations & universities’ leaders from Web of Science & Clarivate Analytics as step forward towards developing national working framework to boost journals’ and universities rankings. Experts from Web of S Clarivate Analytics (former Thomson Reuters) are joining us to brief and discuss the best practices for Pakistani universities and journals to appear higher on international ranking canvas. 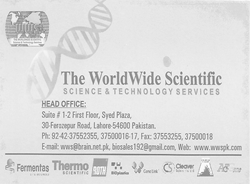 We will have a sizeable audience from multiple cadres of science & research including universities, scholarly journals, quality control, research & university regulating bodies both from federal and provincial quarters. You should attend this conference if you are at leading position at university, editor of a journal, quality control officer, senior or early career scientist to educate yourself on the most relevant scholarly measures. Last date for individual and institutional representative registeration is 01 March 2019. We have 80 seat for individual participation and 20 seats available for the institutional representative category which shall be given on first come first serve basis. For registration and more details please visit ispp2019.als-journal.com.